I was excited when I received this audio bible. Growing up I remember listening to what seemed like an innumerable amount of cassette tapes with the velvety smooth voice of James Earl Jones as he “thee” and “thou” his way through the King’s English. 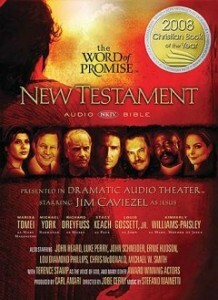 So, needless to say, I was very excited when I saw this was a multi-voiced dramatization of the New King James Version with great actors like Jim Caviezel as Jesus, Lou Gossett Jr. as John, and Michael York. The case is very nice and holds each disc snuggly in place so there is no risk of a disc slipping out of its spot. The tracks can easily be uploaded to an MP3 player for on the go or use the CDs in your player at home or in your car. Each disc holds enough chapters to provide enough listening for a good, non-interrupted, hour or so of round trip commuting. There is a song by Michael W. Smith and behind the scenes DVD. The audio quality was good. I felt like the music score could have been a little bit more variety but was nice to listen to in addition to the sound effects. One thing I didn’t care for was the choice of “casting” the demon voices and the usage of distortion on their voices. To me it seemed to take away from the class of the rest of the recording. Overall, I feel like this is a great product and would highly recommend it to any Christian. Whether they be a new convert or seasoned saint, the Word of Promise New Testament will be a blessing to their life.